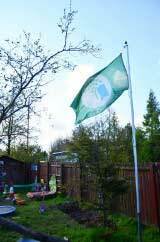 Green Flag Award - Awarded by Eco-schools. Helps to teach children skills for life-long learning and how to care for the world they live in. Breast Feeding Friendly Award - whilst we recognise each families individual choice on feeding their baby, we will actively support mums who wish to breast feed their baby and have met the standard as set down by NHS Scotland. Childsmile/Smile Too Award - Awarded by the NHS for our services in supporting good oral health in children. Gold Health Promotion Award - Awarded by the NHS for our commitment to promoting healthy living for all of our children. Green Tree Award Scheme - Woodlands Trust – Part of our work in improving the world we live in and educating the children on how to care for our outdoor environment. Investors in People - Gold Standard - We are totally committed to staff development and value each and every member of our staff. We believe that children directly benefit from a staff team who are supported and encouraged to reach their full potential. Approved Training Provider - SQA - In order to support staff in gaining SSSC recognised qualifications, a number of our team are registered assessors and verifiers. Meaning they have access to trainers each day and not just once a month at a training centre.